How Effective Are Brady & LCPGV Policies? At first this looks like it might correlate, but the Coefficient of Determination (r2) for these two sets is 0.00009, which is statistically insignificant. This means you can’t explain the variation in violent crime by the variation in the Brady Score for any state. 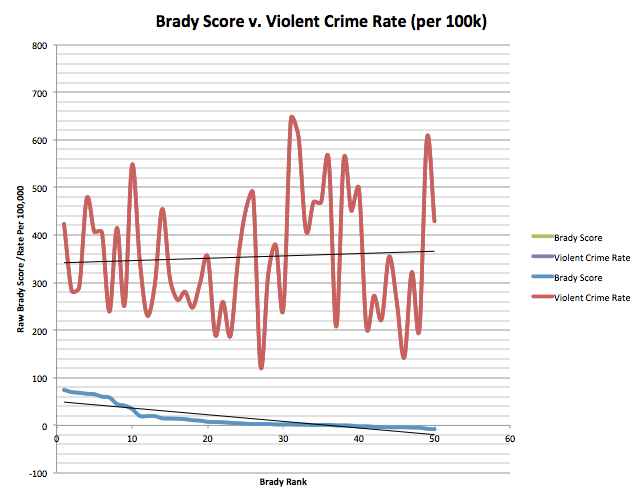 There is no correlation between a state’s Brady Score and that states violent crime rate. Conclusion? Brady policy is not effective at controlling violent crime. So what about other crimes? Perhaps it can control murder? And let’s not forget a favorite Brady tactic of including suicides in their statistics to justify their policies. How does that fare? 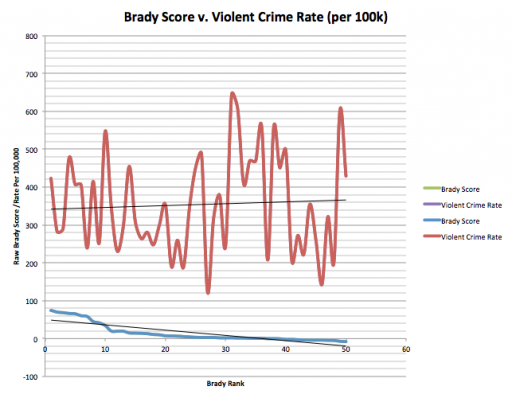 Even visually you can see there’s absolutely no correlation between Brady score and the murder rate, and the statistical calculations bear that out. The r2 value between Brady Score and Murder is 0.004. This is not statistically significant, meaning that the variance in the murder rates between states is not explained by the Brady Score. The Brady folks do a bit better with their nebulous “Gun Death” rate, which is how many people die from gunshot wounds every year, including suicides. The r2 value between Brady Score and Gun Deaths are 0.52, which means 52% of the variation in the gun death rate can statistically be determined by the variation in Brady Score. 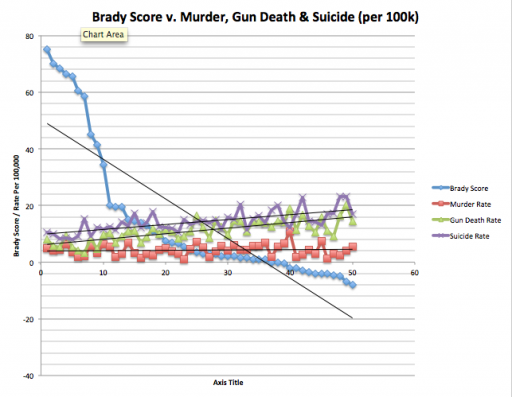 This is statistically significant, and the correlation coefficient (r) is -0.74, which is considered a strong negative correlation (Brady score goes up, gun death goes down). They Brady folks do less well with overall suicide, which has an r2 value of 0.41, and an r value of -0.64, which is considered a moderate relationship. This would tend to suggest there is a considerable substitution effect if guns are not as available. The overall conclusion I think can be reached is that Brady policies have absolutely no effect on violent crime or murder rates, and probably do not greatly affect the availability of firearms to criminals. Brady policy does have a strong effect on the ability of non-criminal citizens to purchase firearms, which is reflected by the correlation between gun deaths (which includes suicides) and Brady Score, and suicide overall. There appears to be a substitution effect of guns are not available, since suicide rates do not correlate as strongly with Brady Score as Gun Death rates. While there is a correlation between state data and suicide rates, international comparisons have found no link between gun prevalence and suicide rates. 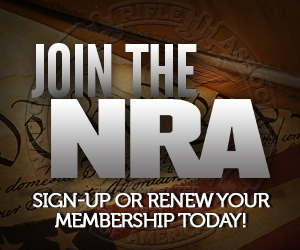 You will see nothing this in-depth from the anti-gun community. To be fair, the lack of correlation does not mean that their policies are useless. For example, states with high brady scores could be inherently more violent. If BRady policies reduce violence, then the states may enjoy lower violence than they would otherwise. To disprove the theory that “Brady policies reduce violent crime” then you’d have to find a way to control for things like urban vs. rural, poverty levels, demographics, etc that may contribute to crime. Luckily, John Lott and the Nat’l Academy of Sciences have both done exactly this analysis and concluded that indeed, the policies are useless. I took the top ten states on the Brady scorecard, added up their homicides for the year and then divided by the total number of homicides in the country. The top ten Brady states account for about 33% of the nations murders. Then I took the ten lowest ranking states from the same Brady list, added up all their homicides for the year and divided, and guess what? The 20% of states with the worst Brady ranking don’t even contribute their “fair share” of 20% of the country’s homicides. 9.9% of Americas murders cone from the lowest ranking 20% of states. Anytime they do one of their “statistical analyses” it will be either “gun deaths” or “gun murders”. They prefer “gun deaths” because throwing suicides gives them a boost. That’s when I like to ask, “Nice work. Now what happens when you use the same methods and calculations substituting “gun deaths” for murder rate”? Crickets. We know this. It’s been obvious for years for anyone who is really interested and looks. The fact of the matter is the Brady folks are not interested in facts. They are ideologues bent on a particular ideological agenda. They don’t care about facts, unless those facts are useful to advance their ideology; when they are not, they ignore them. They’re more than willing to make them up if necessary. There is no point in arguing with them. You can’t discuss rationally with people who are irrational. From time to time, it’s fun to tweak them on their blogs or web sites, but given that most of them engage in “reason discourse,” they’ll simply erase your blog posts and lie about what you wrote. It’s what they do. Joan Peterson is par for the course; she wouldn’t know an honest fact, or deal with an honest discussion, if her very life depended on it. She doesn’t care about facts (and calling her “irrational” is being kind! And yes, Joan, we know you lurk around places like this). The real value of this information is dealing with the vast public, much of which is generally on our side, but doesn’t really know why and is often a bit embarrassed by it. Joe Average knows, intuitively, that disarming the public is a bad idea, but he can’t quite tell you why with solid facts, and he’s been told by the media and perhaps some ideologues (who tout fake facts) that he should be for “common sense” solutions. He knows intuitively that these common sense solutions are wrong, but again, he can’t quite objectively tell you why. We’re arming him with facts. REAL facts, not the fake drivel the other side generally pedals. That’s a plus. Brady policy does have a strong effect on the ability of non-criminal citizens to purchase firearms, which is reflected by the correlation between gun deaths (which includes suicides) and Brady Score, and suicide overall. We don’t have adequate data to be able to tell this, but I suspect it is not so much that Brady score prevents gun ownership, but rather low gun ownership leads to high Brady scores. Where there are not a lot of gun owners- you get lots of gun control (and not much else). Since there is no correlation, does this also mean that increasing gun freedom also does not reduce crime rates? If a lower Brady score equals more gun freedom, then we should see a negative correlation in these charts if less restrictive gun laws help deter crime, right? I think this statistical analysis is well and good, but there’s something that gets lost in such analysis: the actual number of people who die. Do you know the peak number of people per year who were /murdered/ in the last sixty years or so in Vermont? 60, if I recall correctly, and I’m erring on the side of caution. The population itself grew from about 400k to 600k, if I recall correctly. California, if I recall correctly, had 2,000 or 3,000 deaths, maybe as much as 6,000…for a State that has millions of people, even these are small numbers…and that remains so, even when you consider that California had a higher rate of murder as well. And these were straight /murder/ rates–not gun murders. If you think about “gun deaths”–murder and suicide–30k a year in a country of 300,000k is /tiny/. As is the 44k automobile deaths…at which point, a gun grabber might say “but those are different, because they are accidental”…which, if you think about /that/, means that we’re more likely to stop death by banning automobiles, than we are by banning guns, because the latter is deliberate, and anyone intent on suicide or murder is going to find the means to do so. At this point, I honestly don’t think that adjusting the knob on how easy it is to get a gun isn’t going to affect the murder/suicide rate all that much. The numbers are too small, and humans are too determined to do what they decide to do. Since this is the case, why does it even make sense to try regulate guns so much–and multiply the possibilities to put people in prison?